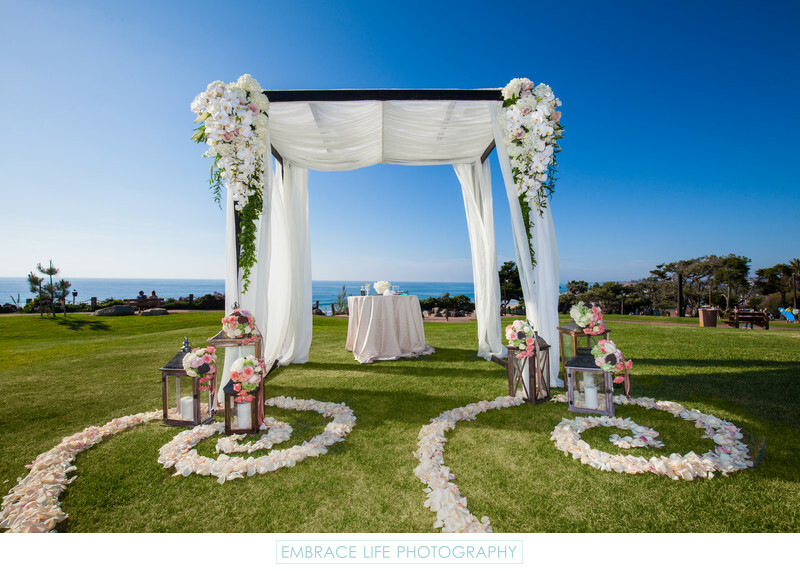 This incredible Del Mar beach wedding ceremony chuppah in Seagrove Park overlooking the ocean is beautifully draped in white fabric, accented by a variety of candles in lantern boxes, and adorned by stunning flower arrangements and floral aisle runner design by Jennifer Cole Florals. All aspects of the wedding took place at L'Auberge Del Mar with the exception of this beachfront wedding at a park that is just a short walk from the San Diego hotel wedding venue. Location: 1540 Camino Del Mar, Del Mar, CA 92014 .